Lance Armstrong suit is dismissed! 9-Jul-2012 by THF in Hoot's Corner | Comments Off on Lance Armstrong suit is dismissed! Lance Armstrong's filing of a lawsuit Monday that sought to block the United States Anti-Doping Agencyfrom punishing him for doping violations it has charged him with, a federal judge in Austin, Tex., struck down the complaint, dealing Armstrong a swift and smarting blow in his hometown. Â¶ Sam Sparks, of United States District Court, chastised Armstrong's lawyers for submitting an 80-plus-page complaint filled with allegations that "were totally irrelevant to Armstrong's claims." Â¶ Sparks said in his order that the court was left to presume that the allegations "were included solely to increase media coverage of this case, and to incite public opinion against" the antidoping agency and Travis Tygart, the agency's chief executive, who is also named as a defendant. Â¶ "This court is not inclined to indulge Armstrong's desire for publicity, self-aggrandizement or vilification of Defendants, by sifting through 80 mostly unnecessary pages in search of the few kernels of factual material relevant to his claims," Sparks said. Â¶ The judge added that Armstrong could refile his case within 20 days, but only if he limited his pleadings to information that was legally relevant to his case. Â¶ The lawsuit claimed that the antidoping agency violated Armstrong's constitutional rights to due process and asked the court to stop the agency from moving forward with its case against him. The suit said the antidoping agency and Tygart were out to prosecute a "big fish" so the agency could justify its existence. Â¶ "Defendants have presented Mr. Armstrong with an impossible and unlawful choice: either accept a lifetime ban and the loss of his competitive achievements, or endure a rigged process where he would be certain to lose and suffer the same outcome," the filing said. 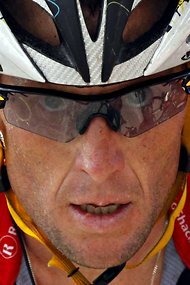 Â¶ Armstrong, who lives in Austin and retired from cycling last year, was charged last month with doping violations and with playing a key role in a doping conspiracy while on the United States Postal Service and Discovery Channel teams. He faces a lifetime ban from Olympic sports, the loss of his Tour titles and the forfeiture of the money and awards he won. Â¶ He has until Saturday afternoon to either accept or reject a sanction from the agency that his court filing said runs a "kangaroo court." Â¶ If he rejects the penalty, his case will proceed to an independent three-person arbitration panel, which his lawsuit called "an arbitration regime" that the antidoping agency "has populated with arbitrators who predictably find in Usada's favor." Â¶ That hearing is mandated by the Ted Stevens Olympic and Amateur Sports Act, which includes a due process checklist that delineates athletes' procedural rights. Any appeals of the arbitrators' decision would be heard by the Court of Arbitration for Sport, the sport's highest authority, and that decision would be final. Â¶ Tygart said Monday that he was not surprised by Armstrong's aggressive move, considering that other athletes "who attempted to have their own rules" have challenged the antidoping agency before, and failed. Â¶ "Just like the other lawsuits that have been filed attempting to circumvent the process, the courts will review it and find similarly, that the process provides full constitutional due process to an accused," Tygart said. "We look forward to that process ensuing." Â¶ Armstrong's lawsuit said that the antidoping agency's arbitration hearing was set up to handle the case of an athlete who had failed a drug test, not one of an athlete like him who had been charged with doping in the absence of a positive test. Â¶ The suit also said the International Cycling Union should have jurisdiction over the case as cycling's international governing body. The United States Anti-Doping Agency brought charges only after Armstrong's former teammate Floyd Landis, who was stripped of the 2006 Tour title for doping, sent an e-mail to USA Cycling in the spring of 2010 about a doping conspiracy on the United States Postal Service squad. Â¶ The antidoping agency only learned about that doping scandal later. Â¶ Armstrong's lawyers also argue that the antidoping agency - which calls itself a quasi-governmental agency - is acting on behalf of the government in dealing with Armstrong's case, which means it should avail Armstrong of greater constitutional procedural protections. Â¶ The lawyers said the agency should be deemed a state actor because it receives a bulk of its funding from the government, is responsible for compliance of an international antidoping treaty and worked "entirely in concert" with federal investigators in an investigation of Armstrong that was dropped in February.